Join Cristhian Cadenas and the Laika on a journey to the holy mountain of Ausangate. During this expedition, we will trek up Peru’s Holy Mountain by foot and/or horseback, camp in the open air and visit natural hot springs, archeological sites, ancient temples and spectacular lagoons. Our journey follows a 10,000-year-old pilgrimage route through stunning vistas of snow-covered mountains to sacred sites where we bring our offerings and receive gifts of power from the mountain. The expedition is open only to advanced students and graduates. All participants must have acclimated to altitude in the Sacred Valley or Cuzco for 4 days prior to start of the expedition. Camp by the sacred waters of the Blue Lagoon. Pray at the Female Jaguar Lagoon and participate in a despacho at the foot of the glacier. Land costs $1,900 for double occupancy (double tent will be provided for you); $2,650 for single occupancy (single tent will be provided for you). 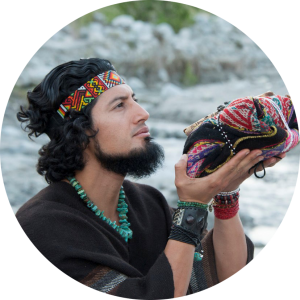 Cristhian Cadenas is a 14-year veteran of the U.S. Armed Forces who was born into a strong lineage of Peruvian “curanderos.” He is currently working towards his Advanced Energy Medicine Practitioner certificate. In his private practice, Cristhian facilitates assorted ceremonies and one-on-one client sessions focusing on physical pain, addictions, emotional trauma, fertility issues, and soul loss. Through the process of illuminations, destiny retrievals, soul retrievals, and other tools, he empowers clients to step into their highest purpose.